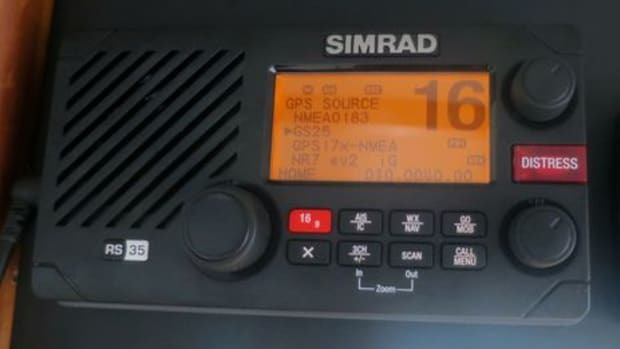 Panbo's first entry about Simrad's unique new solid-state open-array Halo radar tried to cover the promised features. Now, with some help, I'll try to explain how it all works. 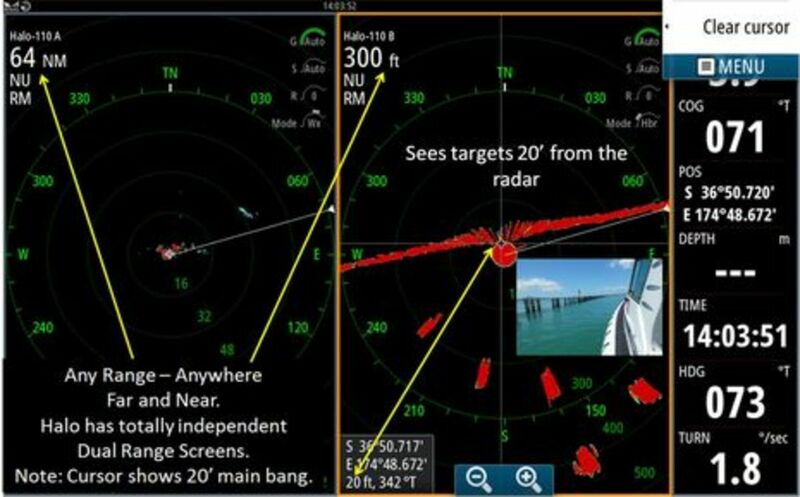 Panbo&apos;s first entry about Simrad&apos;s unique solid-state open-array Halo radar tried to cover the promised features. 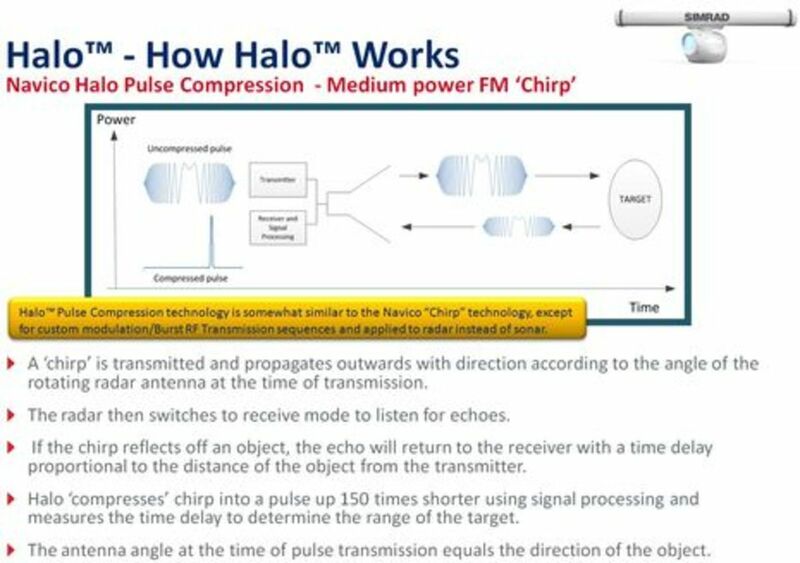 Now I&apos;ll try to explain how it works, with the huge benefit of slides made available to me by Navico senior product manager and engineer Don Korte, who I first met when Broadband (3G/4G) radar was introduced in 2009. I&apos;m starting with the image above because that&apos;s not just Navico marketing; it would be hard to overstate Don&apos;s enthusiasm for Halo as he led me through the presentation. It was a teleconference but I&apos;m pretty sure he was jumping up and down as I slowly got some of the concepts and he answered my smarter questions with a hearty, "YES!" 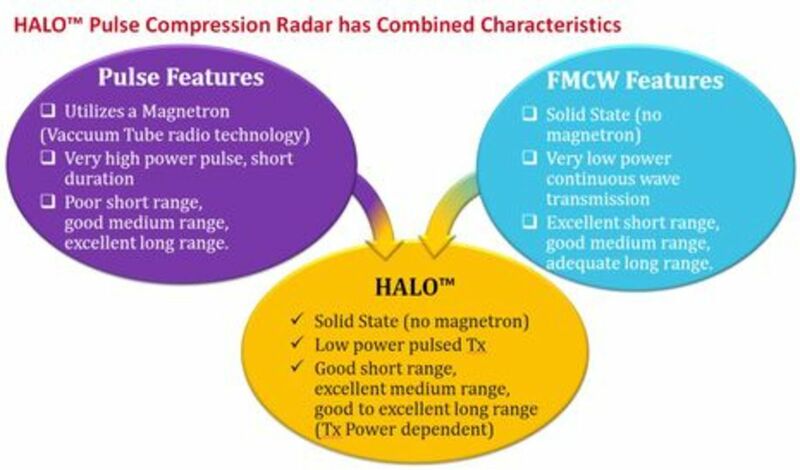 I got a little carried away with the number of slides I&apos;m using, but many are self explanatory, or nearly so, like this beginning breakdown of how Halo compares to traditional magnetron pulse marine radar and the FMCW transmit technology used in 3G/4G radomes. 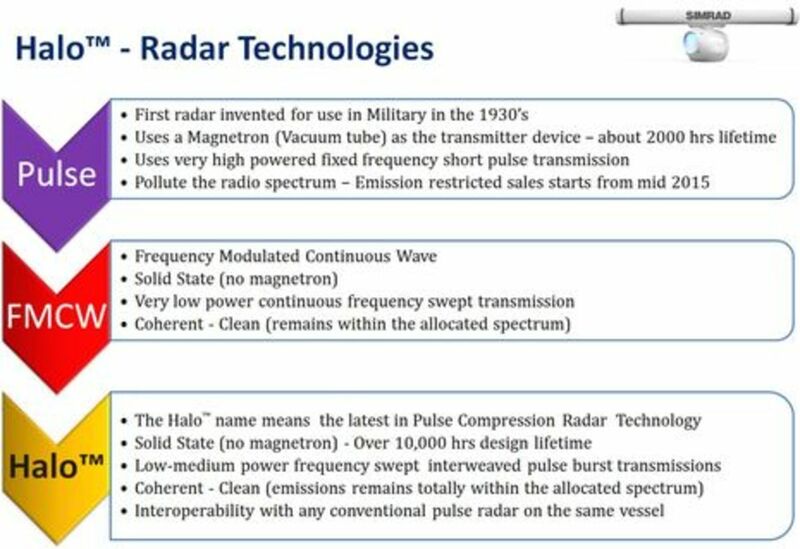 I will note that modern magnetron radars are "clean" enough to pass the upcoming emission restrictions, to my knowledge, and that was explicitly stated for Furuno radars in a recent PMY article about Halo. 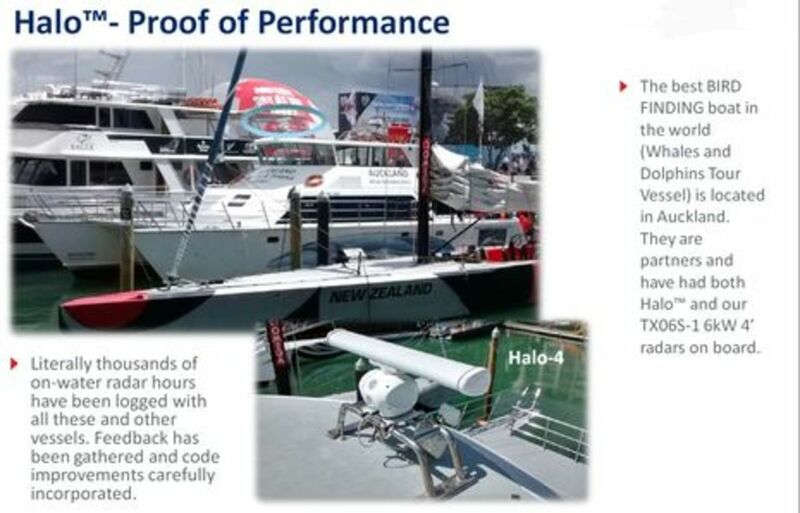 Halo tries to combine the features of magnetron pulse with those of 3G/4G FMCW, and I find it reassuring that Navico humbly terms 3G/4G long range performance as "adequate." That&apos;s been its Achilles Heel. 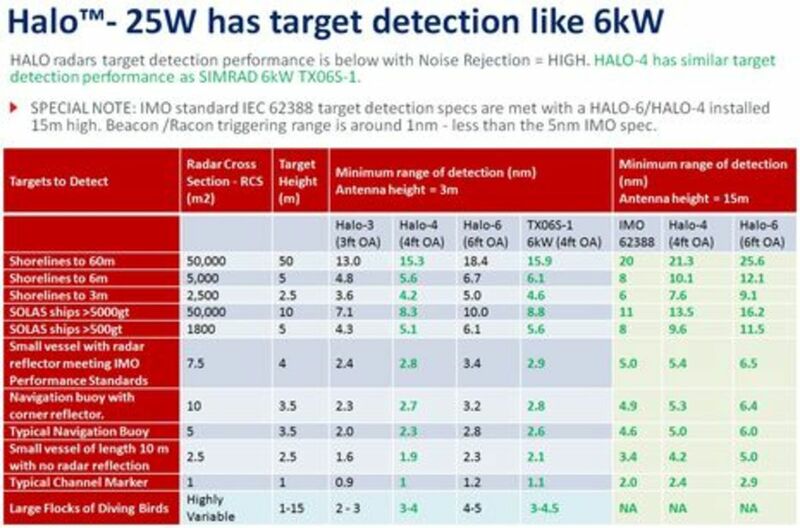 I also note that they&apos;re calling Halo&apos;s long range performance "good to excellent." I know they did extensive A/B testing with the best open-array radars from all the major brands, and I gather that it&apos;s not quite as good as some at distance. However, I think you will be impressed with some of the screenshots way below. 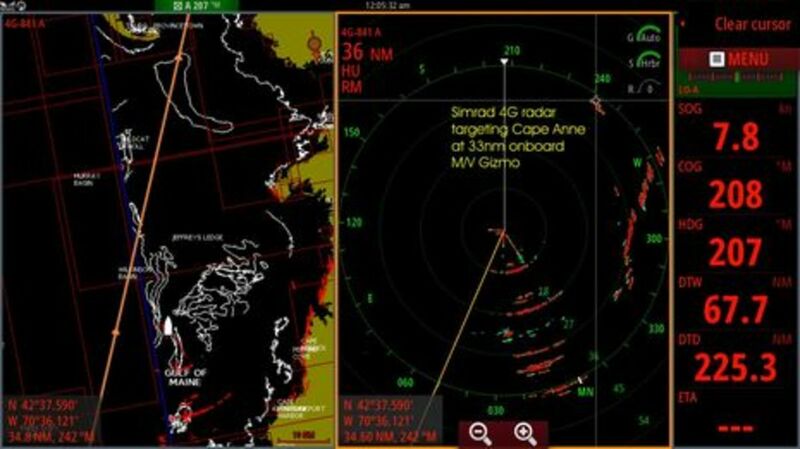 But first here&apos;s a Simrad 4G radar screenshot I took on Gizmo last September while making a night passage from Maine to the Cape Cod Canal. The steep, stony northeast coast of Cape Anne is a great target -- and I saw or would expect performance as good or better from the 3 HD magnetron radars onboard, even the 2kW Furuno -- but I&apos;d say that a consistent 33nm range is at least "adequate." 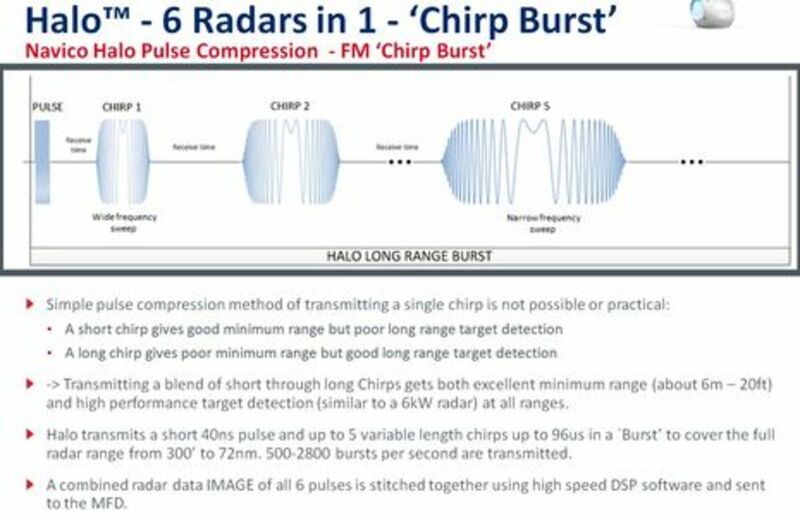 It&apos;s my understanding that the CHIRP-like pulse compression is a common way to do solid-state radar in other fields and in the commercial marine radars that have come out (like Furuno&apos;s FAR3000 S-band option). 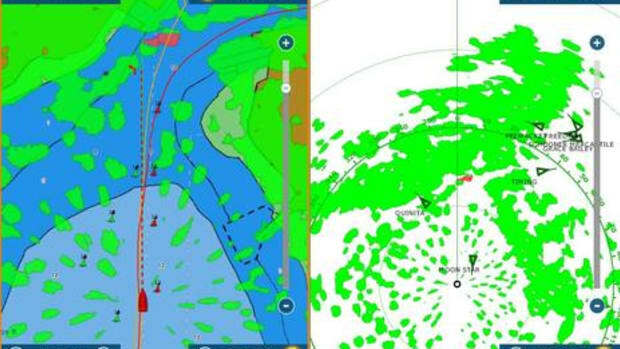 Plus, I gather that Navico is only claiming intellectual property rights on some tangential aspects of Halo (which may be good news for the future of marine radar). But man, it sure looks like they did a lot to make it work well. 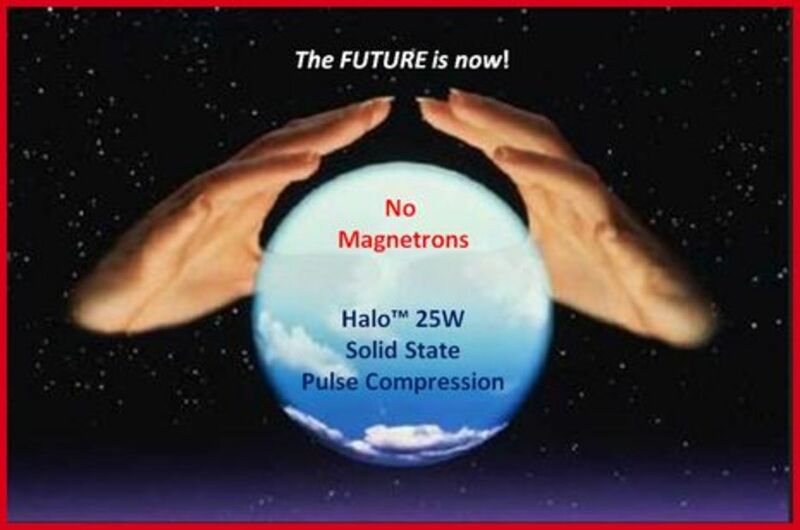 Compressed pulses can effectively be much longer than magnetron pulses, which is part of how a 25W Halo can approach the reach of a 6kW maggie. But even magnetron "long" pulses aren&apos;t good at short ranges. 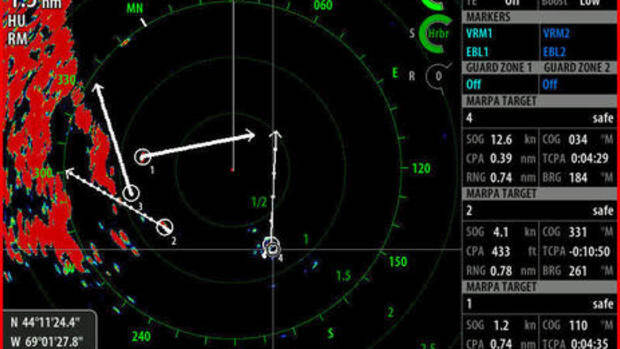 In fact, when I was first taught radar (on a 160-foot offshore oil field boat in the 70&apos;s), I was told to regularly range in so I didn&apos;t miss any close targets. Modern magnetron radars have gotten better in this regard, but certainly not perfect, and the "extra long" Halo pulses were a definite problem. 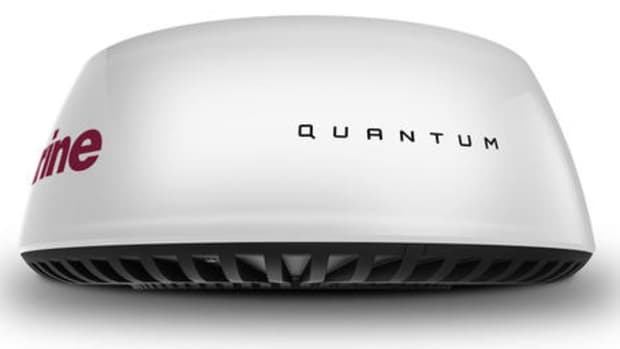 So Halo transmits bursts of pulses, up to six when set to full range. What&apos;s more, after processing each individual pulse, it then draws the target image by stitching together the results of the short pulses for near ranges and longer pulses for further away. 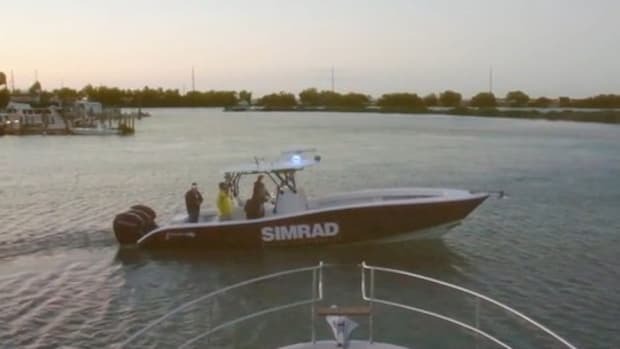 So, yes indeed, Simrad has good reason to call Halo "six radars in one," and it seems like quite an accomplishment. When you&apos;re looking at this radar in any range beyond .25nm -- which is actually handled by a very short pulse, not CHIRPed -- you&apos;re seeing more than one set of pulse interpretations, up to six. No matter the range, close targets should show (if your screen has enough pixels). Apparently one of the major challenges was getting targets that sit on a pulse/range border to look right even though they&apos;re "stitched" together. 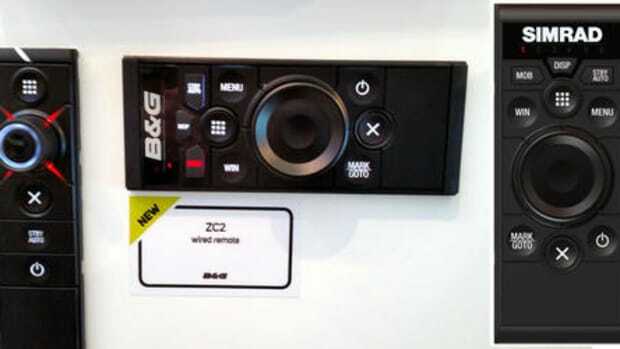 The pulse burst technology is purportedly also great for dual range mode, which Navico had already developed nicely in the 4G radome. 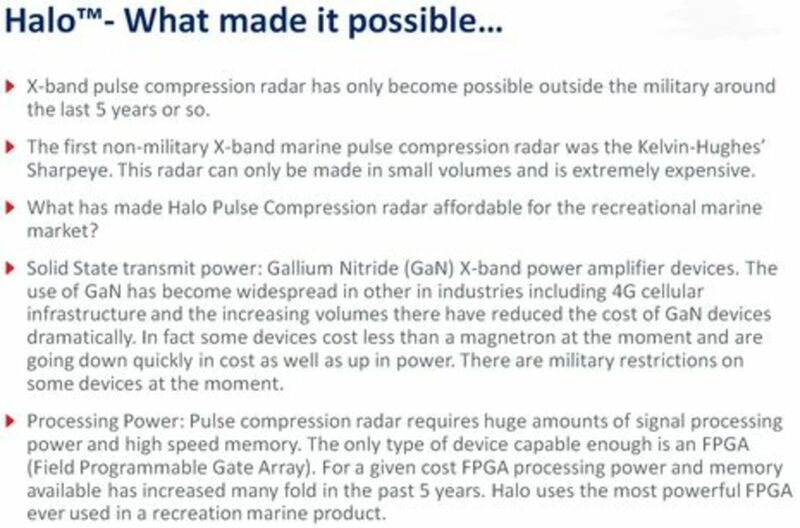 Even if you&apos;re in the Halo-4&apos;s maximum 64nm range, the radar is already looking at the minimum 300 ft range pulses, and so it&apos;s just a matter of setting up the second window and permitting individual controls or modes. Note that in this dual range screen the long range is in Wx mode while the near one is in Hbr. 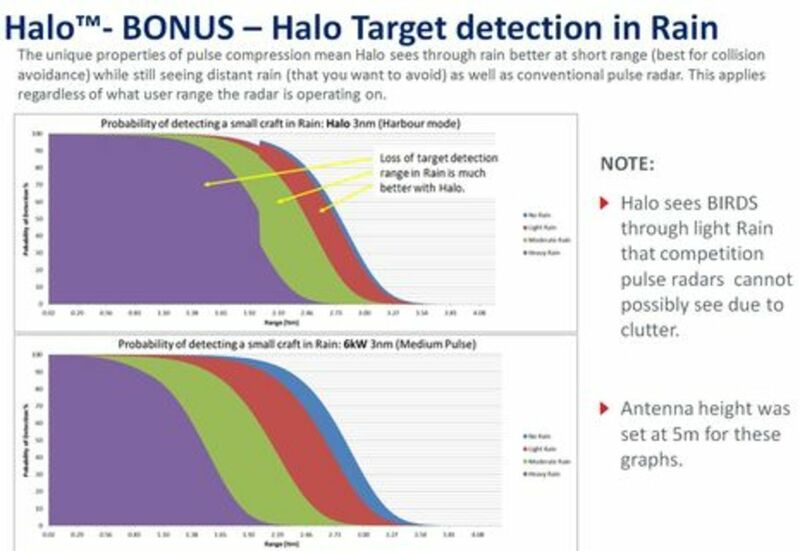 And note that Halo dual range is how I got the catchy title "12 radars in one" (though you&apos;d have to have both ranges set quite long to get all 12). 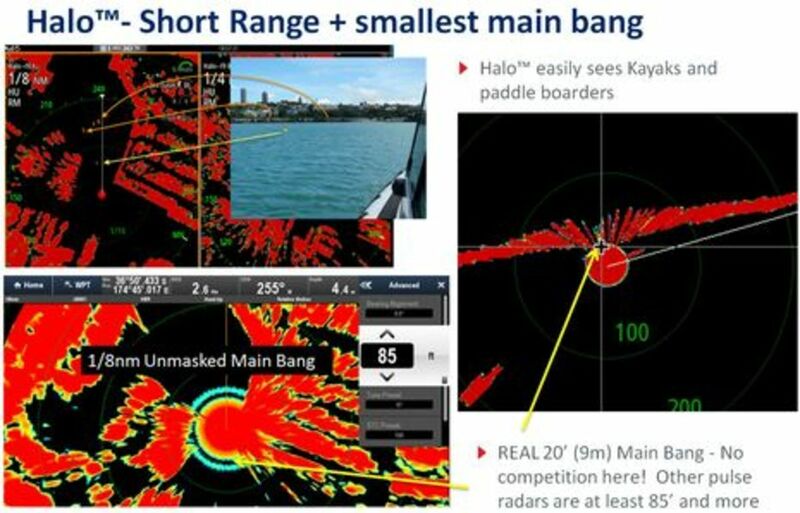 Of course, Simrad is proud of Halo&apos;s near zero "main bang" (the area so close to your boat that the radar can&apos;t receive returning pulses). 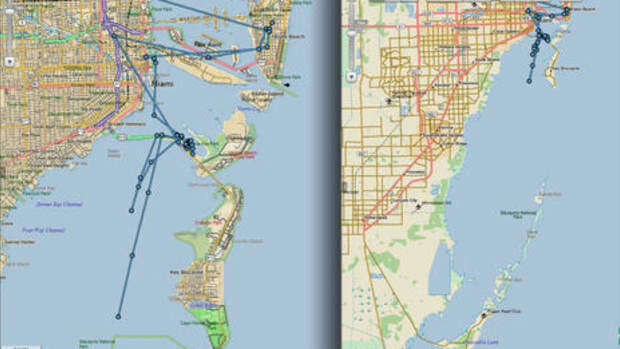 I&apos;ve never thought that this feature was a huge deal because actionable targets are usually further away and modern magnetron radars seem to be pretty quick anyway (shown above is a Raymarine SHD with only 85 feet obscured). But any and all situational awareness is a good thing, and I did see Halo image pelican butts at about 20 feet. ...and here&apos;s one of the Proof of Performance screens that nicely complement the presentation Don showed me. Here&apos;s a Halo-4 with a declared maximum range of 64NM imaging a weather cell at over 65NM. Note, though, that it&apos;s in Custom mode and at least the gain has been manually set, and maybe the speed slowed down. 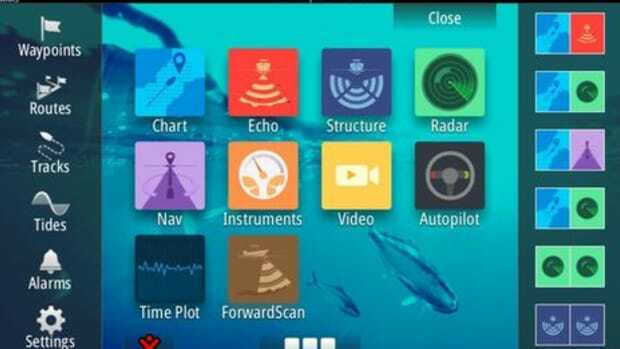 Here&apos;s another weather screen that I particularly liked as one of my few gripes with 4G, and what I saw of Halo in Florida, is that they didn&apos;t seem to use true color as well as competitors like Raymarine and Furuno. However, the use of color here to mark rain density seems excellent, and it&apos;s being done automatically in Wx mode. You may be pleased to know that this is the next to last diagram in this entry. 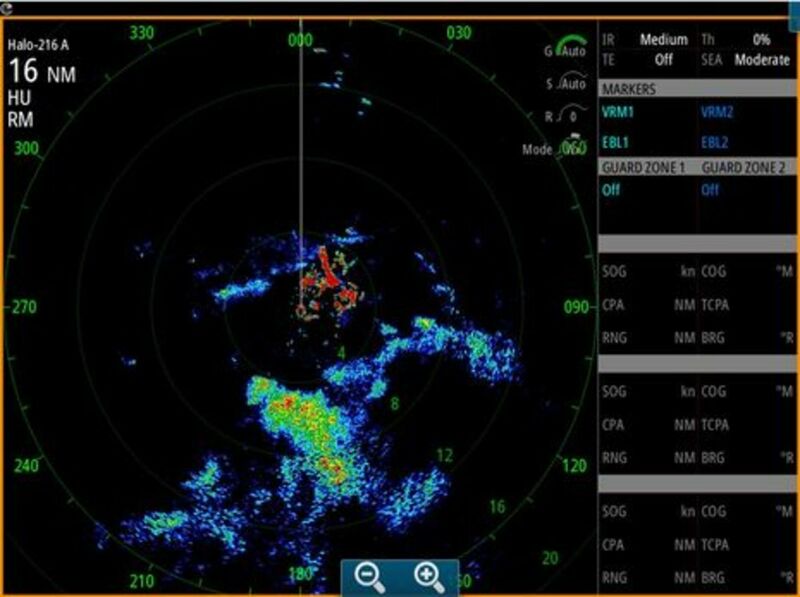 It shows how the Halo models test against Simrad&apos;s own TX06S 6kW 4-foot open-array. 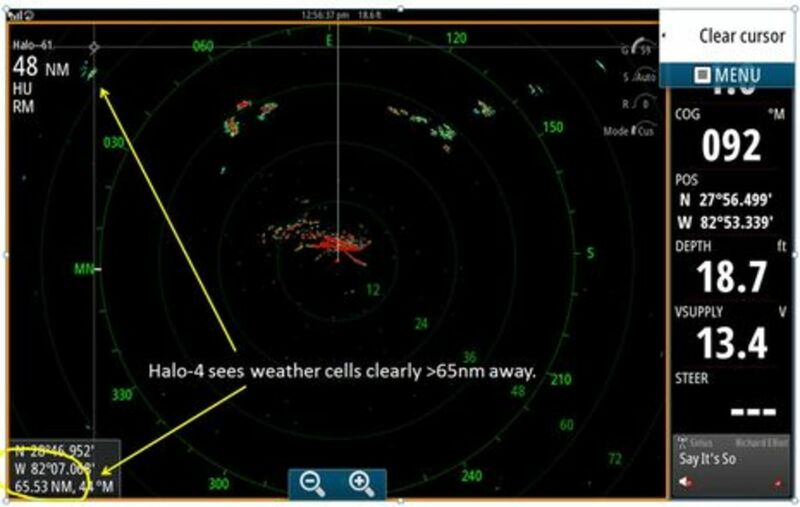 Note that the ability to see radar SART beacons and RACONs is a promised feature, not a shipping one, as discussed in the first Halo entry. 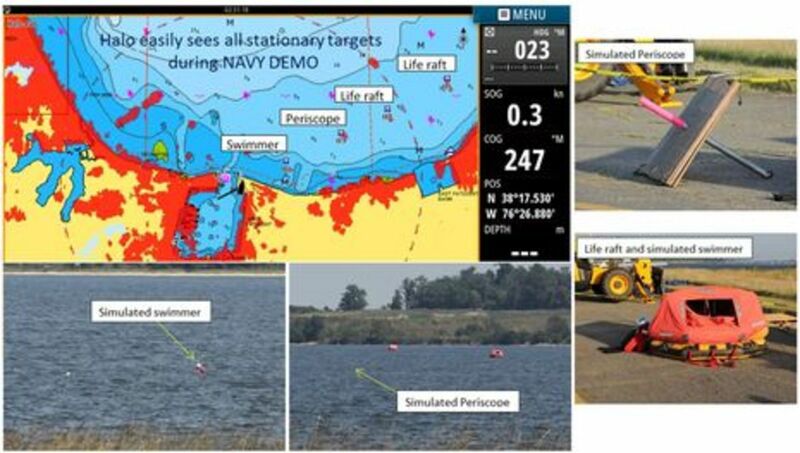 Apparently, Navico showed off Halo to the U.S. Navy at their big Naval Air Station Patuxent facility, and at least they got some neat testing images out of it. It&apos;s not often that we get to see small target photos like these. 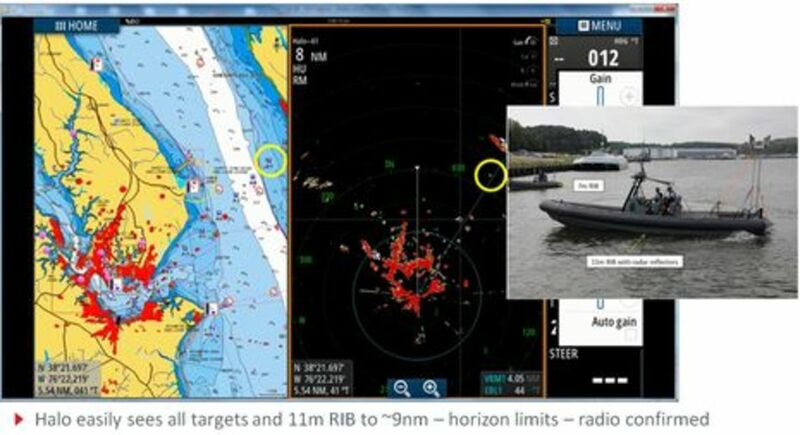 Also impressive is imaging a big RIB at about 9nm, though it did have a substantial radar reflector. I&apos;d guess that Don Korte captured this screen near his base in Tampa, Florida. 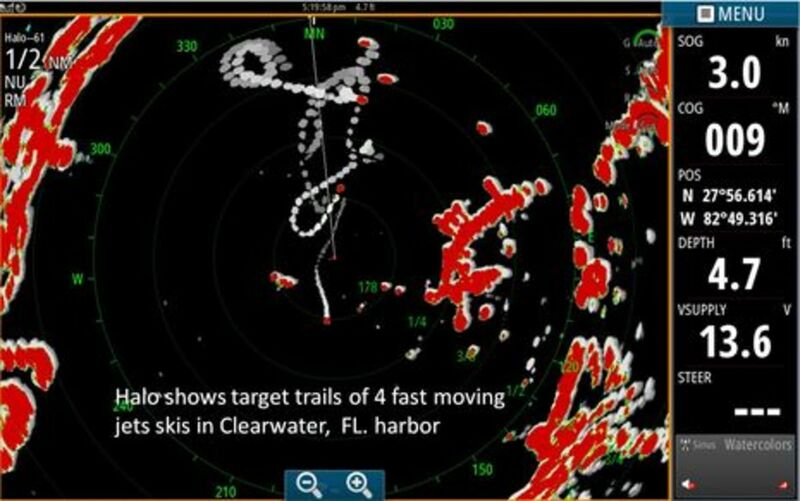 It shows how Halo&apos;s target trails mode, probably combined with high speed antenna rotation (48 rpm), can image goofball jet skiers. 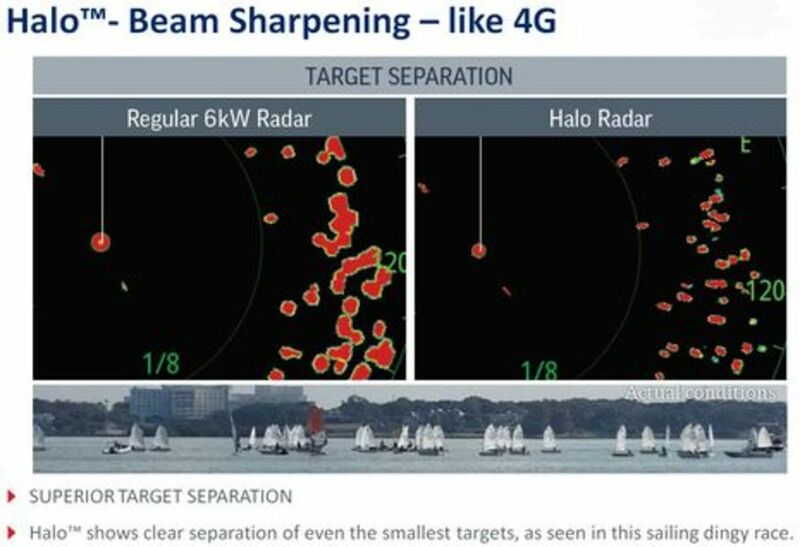 And here&apos;s a good illustration of how the Halo (and 4G) Beam Sharpening feature can be useful, actually better than the off/low/med/high screen shown in the first Halo entry. 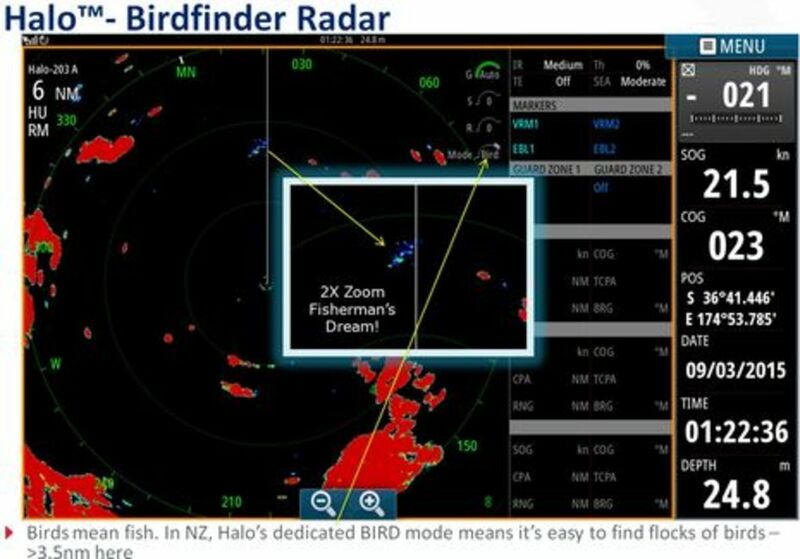 Most Halo testing happened in New Zealand, and this one shows effective Bird mode (and use of color). ...while this one illustrates one of the test vessels. 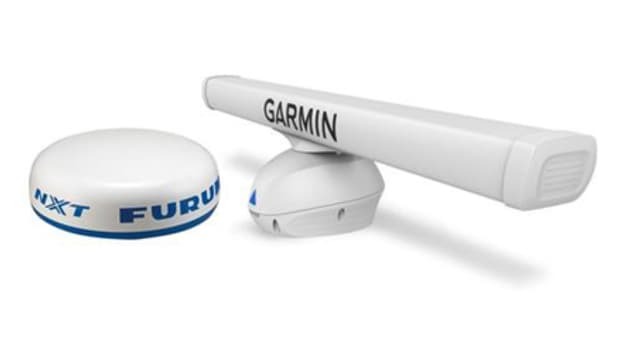 The presentation also shows numerous smaller vessels equipped with Halo alongside Furuno, Garmin, and Raymarine, but I think I&apos;ve gone on long enough! 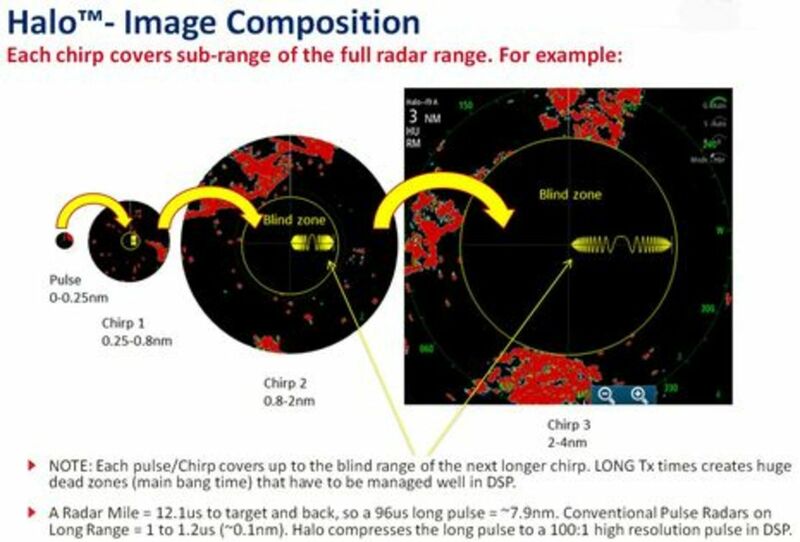 The closing image is a Halo "bonus" slide that&apos;s interesting and also reminded me of heavy clutter target detection diagrams I&apos;ve seen for the Kelvin Hughes SharpEye. When I asked Don if Halo was possibly capable of the doppler technology SharpEye uses, or even just the ARPA that Furuno has managed to put in even its UHD radomes, he could barely contain himself. Suffice it to say that Halo likely has room to grow built in.